You guys, I’m totally in love. With this yummy tomato-saucy braised BEEF ragu. As in beautifully browned and slow cooked meat. Like, what is even going on in the best possible way. As evidenced by recipes like these overwhelmingly Veggie Lentil Curry Bowls with cashew sauce, I am a self-declared most-of-the-time-vegetarian. I don’t really LOVE love chicken (it’s okay, haters gon hate) and I definitely doesn’t do large cuts of meat unless they are going to become perfectly golden brown and crispy Crockpot Carnitas which will then ultimately serve as a vehicle for mass quantities of cilantro, beans, cheese, and guacamole. After 5 years worth of posts, I could count the Pinch of Yum beef recipes on one hand. But tadahhh! Look at me, Mom! I’m becoming a grown up who likes recipes called Crockpot Braised Beef Ragu with Polenta. It can be soft and sort of mushy-like (my favorite). It can be hard and sort of chewy-like (Bjork’s favorite). It’s just made with cornmeal – like literally if you have cornmeal in your house right now, you can make it. WHAT ARE YOU WAITING FOR. It only takes three seconds to make which means I can quickly get back to InstaStalking my friends. It goes with anything, like, for example, this here CROCKPOT BRAISED BEEF RAGU yummy. I feels ultra fancy when I tell people I’m making polenta. Pinkies up! About a year ago, Giada and/or Giada’s ghost writers taught me how to make polenta from scratch. Right – from scratch, so I’m not talking about the premade tube of polenta from Trader Joe’s, which I most definitely have purchased and enjoyed in the past. Today I’m talking about a bubbling pot of homemade polenta on your stove. Bjork loved it so much and my wannabe-foodie-but-likes-easy-recipes soul loved it so much that I’ve never ever looked back. If you haven’t tried polenta, now is your time. Chili on polenta, poached egg on polenta, braised beef on polenta, oh my. As of today, like, this very day, I’m going to live and eat and do my thing for 60 days without refined sugar. Whoaaaaa! Yep. Crazy food lady is back. This summer Bjork and I participated in a 60-day course called Go Sugar Free where we learned about the effects sugar has on the body and ways to form lasting habits that allow us freedom from sugar (and that link is an affiliate link because we highly recommend the way Jacqueline supports, teaches, and inspires through this course). You can read the recap post about our previous experience with the course here. I had been toying around with the idea of rejoining the course for a while, thinking like hey! I sort of enjoyed that little experiment, and maybe I should do it again… but then yesterday I actually decided to get serious about it, and I looked up the details for the next course, and guess what? It starts TODAY. So I recommitted myself just in time for the start of this round, and Bjork, by some really awesome husbandly miracle, has decided to take the jump with me. There are a lot of reasons that I’ve decided to do this again, but the top two reasons are that 1) I just genuinely like how I feel when I eat good, real, unprocessed food without all the sneaky added sugar, and 2) I am extremely inspired by the personal and professional (?) challenge of making really, really, really good recipes that taste good, period. No sugar required. It gives me a little happy zing to think that I can create veg-heavy healthier recipes without refined sugar that will resonate with a mainstream audience of busy home cooks. Like, lentil curry? Seriously? You guys, too? And here I thought I was the only one. If the challenge of creating recipes without sugar can help us enjoy a superdelicious + healthy lifestyle, I am ALL OVER THAT. Okay but just a quick leetle disclaimer: Friday’s post is going to sugar-bomb your world (no regrets! no regrets. ), and then after that, we’ll be free and clean of sugar for the next 60 days, and if I do my job as a food blogger well, you’ll forget I’m even doing anything different. Aha! Trickery. Now, back to the beauty of Crockpot Braised Beef Ragu and Polenta. This is warm, cozy, and saucy. It’s tomato-tangy with perfect San Marzano Italian canned tomatoes and richly flavored with red wine, bay leaves, and nice little pinches of basil and oregano. The beef is tender, the polenta is semi-firm and perfectly textured, and the specks of bright green parsley are pritty to look at. Also, you guys, you must put a last minute hunk of goat cheese on top of this. Not negotiable. Creamy, tangy, and absolutely heavenly. Hello Dinner I SEEEEE YOOOOU. 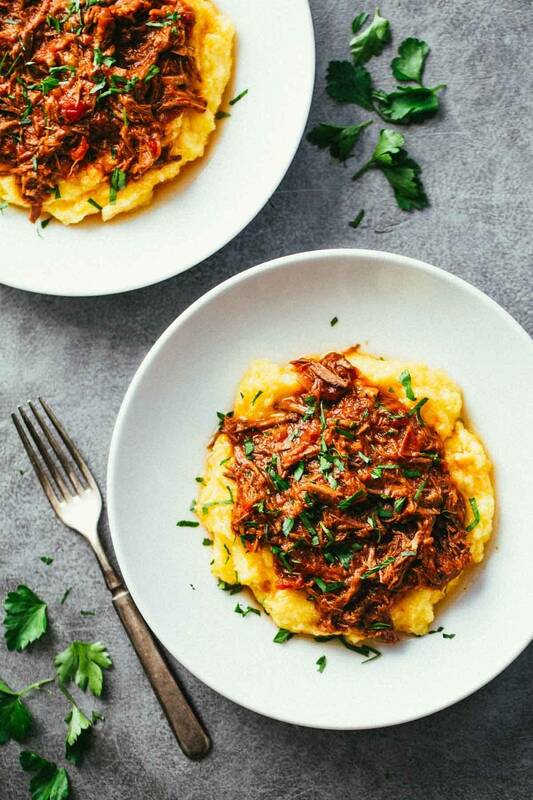 Crockpot Braised Beef Ragu with Polenta! Browned meat with canned tomatoes and flavored with red wine, bay leaves, and pinches of basil and oregano. Optional, but for best tasting results: Heat the olive oil in a large, deep frying pan. Add the beef in one whole piece and fry on each side for about 5 minutes, turning until the whole exterior is golden brown. I had some splattering issues so I covered the pan with a lid. Place all remaining ingredients with the beef in a crockpot or slow cooker (5 quart size worked for me). Cover and cook on low for 7-8 hours. When the beef falls apart easily when pulled at with two forks, it is ready. Shred the beef into pieces and give it a good stir. For the polenta, boil the water and add the salt. Slowly add the cornmeal, whisking constantly to avoid lumps. The polenta will start to thicken quickly. Continue whisking or stirring for 2-3 minutes before removing from heat. Stir in the butter until melted (you can also add cheese I’M JUST SAYING). For solid and chewy polenta, pour into a rectangular dish, let cool for 15-20 minutes, and cut into pieces. For softer polenta (my preference), serve scoops of polenta immediately before it has hardened. I’ve done this a few ways in terms of the tomato sauce — I’ve used two cans, with one drained and one undrained. I’ve used two full cans, both undrained. And I’ve used just one can, undrained. So it can work a lot of different ways – it just depends on your desired meat-to-tomato ratio for the sauce. Hi Abbey! Sounds like it needs a bit more time in the crockpot. Usually when it’s tough like that, it’s because it hasn’t cooked long enough. More liquid may help as well. Thanks for your feedback. I agree, it sounds like it needed to be cooked longer. For a more flavorful polenta, use chicken stock next time instead water and then season to taste. You could also add in cheese of choice if your family eats dairy. are you recommending goat cheese in the polenta, under the ragout? So, would packaged grits work instead? I have been making Shrimp, Grits, and Bacon a lot lately and have used packages of grits, that I also put a pinch of saffron in the water, Recipe also calls for evaporated milk, which makes it really creamy and nice. Made this twice and LOVE it so much! I dream about it. For real. I’ve made this, and all I have to say is that it’s DAMN good! Do you break up the whole tomatoes at all? No need to! The tomatoes will break down as it cooks in the crockpot. The ragu part of this was good, although I would probably only do 7 hours. The polenta…how could anyone consider it done after 3 minutes! After 15 it was still grainy so I just boiled some pasta. Even when the pasta was done, the polenta still needed some work. Glad I had pasta in the pantry! After reading all of the comments I was excited to try the beef ragout. I was wholly disappointed as the depth and complexity of flavour that is predominant in braised meat was missing. The ragout just tasted like beef in tomatoes. When I reviewed the recipe again and re-read the comments, most people were commenting on the food styling and photography, not the actual recipe and final product. I made this for dinner tonight 🙂 thanks!!! i cant WAIT to make this tonight! This is one of our family faves — we make it often! Sorry to hear that, Samantha. Unfortunately it’s hard for us to know what went wrong without seeing it. Really appreciate your feedback! Can this recipe be converted to pressure cooking? We haven’t tried it, so can’t really say! Could i half this recipe and what would I replace with the red wine? Paige, you could use beef broth instead. That’s what I would do. Are the herbs fresh or dried? I’m assuming dried but wanted to double check! I love polenta and super excited to make this! I too love polenta. I usually have it with Italian Sausage w/peppers & onions cooked in red sauce. This recipe looks amazing and I can’t wait to try it! Do you think the Ragu Portion would freeze well? This looks awesome! We are having an office potluck this week and I think this might be my golden ticket! Is the polenta easy to reheat? I’ve never tried it so I’m going blind into new territory here. If not, is there another serving suggestion (pasta vs. potatoes vs. anything else)? Has anyone tried crushed tomatoes instead of whole? Whole tend to be pretty watery, in my opinion. Can you do this in an Insta Pot/pressure cooker? We don’t see why not! Does the recipe call for fresh or dried basil/oregano? No, it should be dried! This recipe is the bomb. Like you, I have used 1 can undrained, 2 cans – 1 drained and 1 undrained. Both ways are delish. I have served over the polenta, pasta and tonight I am serving it over egg noodles. Freezes beautifully.